None of the globe’s cobot manufacturers, either separately or collectively, have the manufacturing capacity to meet the enormous, future demand—735,000 cobots annually—that are forecast for 2025—a mere six years off. Look at the gaudy numbers on the chart below from HMC Investment Securities; HMC’s is but one of many similar projections. Doubtless, cobots have a great and glorious future ahead, and deserve all the attention and sales that they are getting these days. However, is such a delirious future too great for cobot makers to handle? See also: The Promise of Cobots…Delivered! The world’s leading cobot builder, Denmark’s Universal Robots (UR), has taken some five years to build, sell, and deploy 25,000 of its UR cobots. That’s a pittance compared to what is needed on an annual basis: 735,000. That’s a cool $9 billion by 2025! 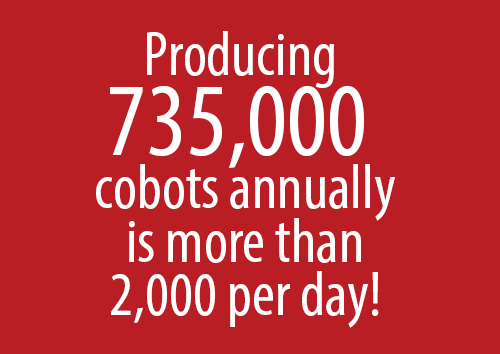 At an average price of $20k per cobot, that tallies up to 450,000 cobots…annually! The real question is: How many of those 450,000 will UR build each year? The quick answer: Not many! And how will the cobot industry adequately provide service for some half-million cobots annually? New questions, tough questions for a brand-new industry. Even the 2025 projected sales numbers could end up on the low side of actual need. Worldwide there are approximately six million factories 70 percent of which are SMEs, who are a cobot vendor’s primary sales targets. Generally, cobot sales over the past three years have followed a pattern whereby an SME experiments with one or two cobots at first, then orders more as the cobots are integrated into an SME’s work flow and found to be successful. The cobot’s addressable market then is super huge, spread out over a wide geography, and primarily made up of SMEs who buy one or two robots as beginner automation before considering more. That’s smart for SME’s but also makes for a wider sale’s net, smaller orders, and service challenges for cobot vendors. Mark Jagiela, CEO of Teradyne (UR’s parent company) confirmed during a recent earnings call that he has no large cobot orders from big companies, and that, indeed, selling cobots is a onesie-twosie business. All of which points to added expenses that the addressable cobot market presents. Is this inability or reticence or both on the part of cobot makers to scale production leaving the door wide open for an interloper, a mega-size industrial interloper, to seize the market? Is disruption imminent for the cobot industry? If production speed and precision manufacturing are the criteria, interlopers from the automotive world first come to mind: think, Toyota, Hyundai, Volkswagen, etc. Auto makers have the manufacturing chops and global reach to easily take on mass cobot manufacturing. Will cobot pioneers get squeezed out? To be fair, UR introduced and pioneered the idea of the cobot, and has had to create a market for them as well as build out service capabilities. That surely takes time, effort and money. UR is also to be commended as the cobot builder that created demand: UR showed the world why cobots are needed and how to use them. UR’s cobot jolted the robotics industry from its slumbers and opened its eyes to a brand new world of collaborative robots (cobots), one with a limitless horizon for sales…and stupendous profits. “We didn’t expect large manufacturers would want to use such robots, because those robots can lift only a light weight and have limited capabilities,” said Kazuo Hariki, an executive director at FANUC, which is the world’s third largest industrial robot manufacturer, with annual revenue well north of $4 billion. Such was the prevailing sentiment from most of the largest, most deep-pocketed industrial robot makers until UR proved them all wrong. As a result, UR has had the cobot industry to itself these past few years. Okay, UR, job well done. Word spread fast. Now there are 42 cobot manufacturers on the planet. Well, 41, actually: FANUC rushed out in early 2018 to scoop up cobot manufacturer Life Robotics. Now what? Cobots need to scale in order to meet the anticipated demand, yet no cobot maker—no industrial robot builder, for that matter—has shown itself capable at meeting the numbers that forecasters are projecting. Category leader by far, UR, from its lone plant in Denmark (all of its cobots are Danish built) won’t produce near enough. UR’s president, Juergen von Hollen, in an interview with the India Times, said the company is in decision mode about a second Danish factory, but even that’s also not enough capacity to meet future need. The market is definitely there and growing fast. UR reported a 72 percent jump in revenue to $170 million last year, and expects to grow at least 50 percent in 2018. That bears repeating: “several dozen times its current size.” Yowsa! What cobot maker can scale to meet that market? No doubt more than a few big-boy manufacturers are taking a serious look at the cobot biz. Could a manufacturing behemoth like Toyota, or Volkswagen or Hyundai swoop in on this nascent cobot industry and take over a huge piece, maybe all of it? What about Toyota? Toyota is financially troubled enough these days to maybe give it a try. Toyota’s Akio Toyoda is preparing for an expected full-year net profit drop of 15 percent, courtesy mostly of Trump administration tariffs. A 25 percent tariff on steel plus 10 percent on aluminum hurts enough, but an impending 25 percent tariff on cars entering the U.S. would be a killer. Sure, Toyota makes millions of cars in the U.S., but not its best-selling RAV4, which is built entirely in Japan. So too are many major parts from engines to transmissions that will be subject to tariffs. The bleeding could get worse. A new revenue source might not be a bad thing. A short distance across the Sea of Japan is a mega-size customer with a voracious appetite for robots (139,000 industrial robots in 2017). China, the world’s largest consumer of industrial robots, may well become the world’s largest consumer of cobots. In 2017, China bought barely 3,000 cobots; that number is bound to skyrocket over the next five years, especially since two million of the world’s six million factories reside in China. Toyota could lean on its robotics division as well as the Toyota Research Institute (TRI) (Silicon Valley) to help it to decide which one or none of the existing 41 cobot makers to acquire. Maybe buy five or six of the top makers and then merge the best aspects of their tech into a single cobot. If that doesn’t pan out, get TRI honchos Gill Pratt or James Kuffner to cook up an algorithm to design an original. Cobots are elegant-looking but rather simple machines to build; developing a more-than-passable cobot shouldn’t be that difficult. Even cloning the UR machines is a possibility. UR has already shown the industry what winning cobots look like, how to build them, who will buy them and why. That was the hard part. Now cobots need to be mass produced. Something cobot pioneers don’t seem ready to do on their own. Toyota says that it takes 17 hours to put together the 30,000 parts that make up a Camry. Even with that level of complex manufacturing, Toyota’s Japanese factories push out more than 13,000 vehicles a day. Knocking out thousands of cobots should be a piece of cake. Post-production is where auto makers, especially Toyota, have a huge leg up. For one thing, Toyota showrooms, like 7-11 stores, are everywhere in the world. Toyota vehicles sharing floor space with cobots would be easy enough to arrange. Showrooms are also quite handy for nearby SMEs to pop over for a demo right in their own neighborhoods…and maybe consider a company van or auto while at a cobot demo. While experiencing a live demo at the Toyota showroom, potential cobot buyers might also snap on a pair of augmented reality (AR) goggles to demo ease of setup, maintenance, troubleshooting, etc. A pair of AR goggles might come free with a cobot purchase. Nice way for Toyota to stay close to the customer at all times. Far better than tradeshows or conferences could, Toyota showrooms might be superior places for attracting 100 percent end users. Try doing that at IMTS! In short, Toyota has the global merchandising and sales infrastructure already in place to sell cobots by the millions…including Toyota financing! No Toyota showroom would ever need to store cobot inventory. Each customer’s “cobot in a box”, including the free AR goggles, would be shipped in a day to the customer’s factory. Throw in a cobot version of a bumper-to-bumper guarantee plus a bit of predictive analytics, all wrapped up in the aura of Toyota brand confidence, and zamo! Toyota cobots have customers for life. What about a name change to Toybots? Jus’ say’n.